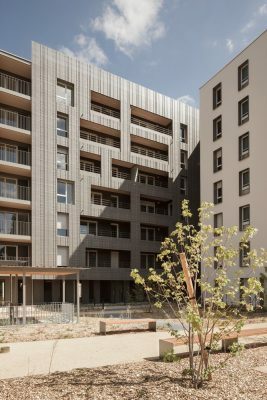 How to approach designing a building offering 56 homes that also creates a balanced urban dynamic in an area undergoing a profound transformation? How to reclaim the river banks, open up a neighbourhood cut off by the canal and the ring road? How to imagine an architectural concept which looks towards the architecture of the future that is yet to be invented and to the surrounding natural environment intended to grow and develop? 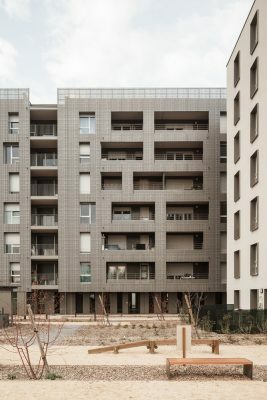 These are the ambitions of the Cap Canal project, for which the architects at the Rue Royal practice drew inspiration from the duality which so often characterises these buildings: the duality of materials, initially the most obvious contrast, as well as that of the north and south aspects of the building, of the interplay between the built and the unbuilt, of matte and shiny finishes and of the staggered volumes etc. 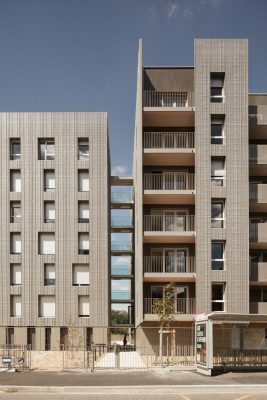 This inspiration serves a commitment to providing increasingly high quality social housing, adopting a demanding and complex approach to increase space, light, privacy, view and comfort. 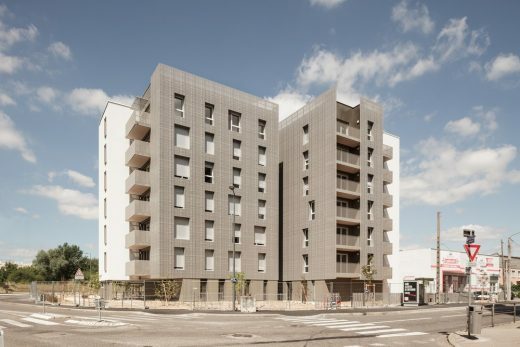 In the Saint-Jean neighbourhood of Villeurbanne, which rubs shoulders with the town of Vaulx-en-Velin, this flagship project stands as a silent manifesto. 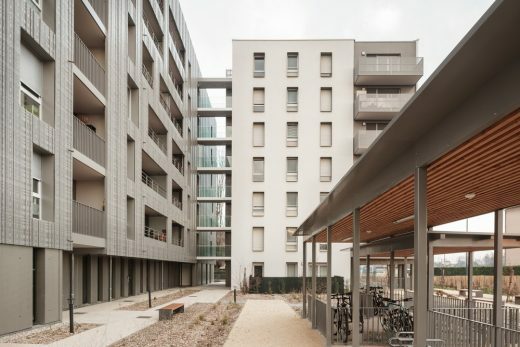 Cap Canal plays a very special role in the redevelopment of this changing territory. As the first project, it is both the trigger and the bow of the ship, the starting point for the dynamic, setting the pace for future projects to come. 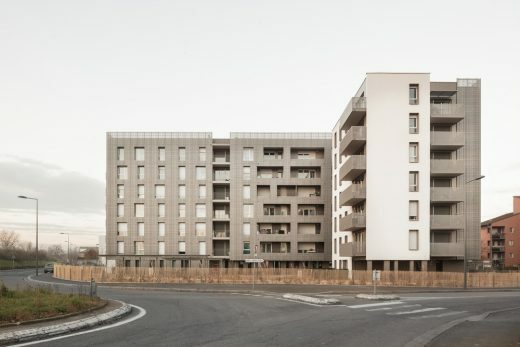 Unlike a finished object which takes up the whole plot of land, this block with its comb-like block plan, perpendicular to the canal and rue de Verdun, are a sign of a permeable city structure creating transparencies between the canal and future buildings, a stable structure for the area’s future urban development with a porous relationship between the architecture and surrounding natural environment. 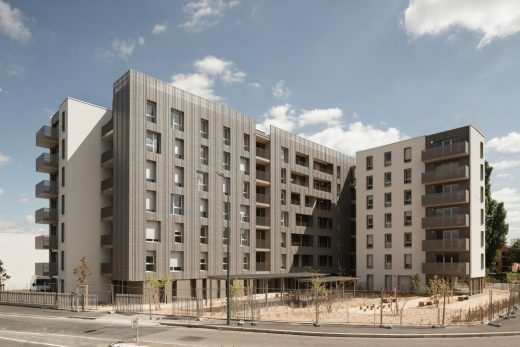 The block plan is distributed in a simple and effective fashion around two buildings: the main building forms a block to the north surrounded by surface parking at ground level. 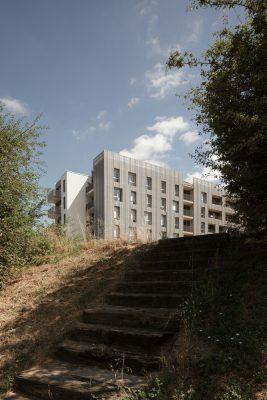 To the south, a block set at right-angles marks the end point of the layout which continues out with garden strips extending out to the perimeter of the plot. 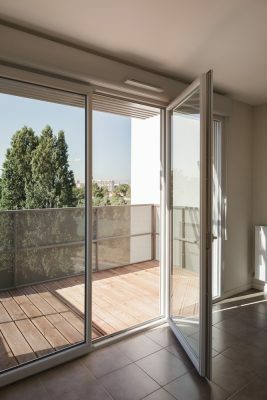 The two buildings are connected with glass walkways, creating a gap which contributes to the desired transparency, offering views into the heart of the plot, extended on the ground floor by the main footpath leading to the apartments. 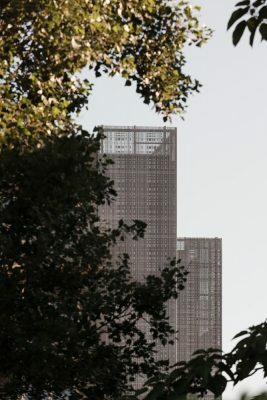 Each building is divided into two volumes which fit one over the other. 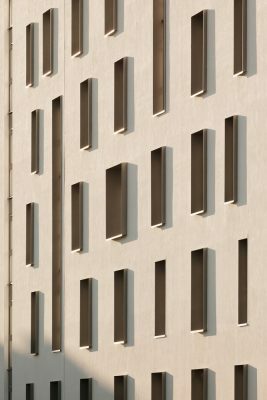 This staggered arrangement, which lightens the architecture, can be seen in the variations in heights and lengths, creating differentiated planes through the use of two materials with contrasting colours and textures. 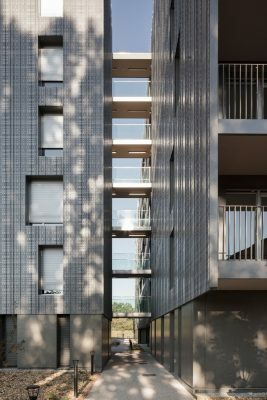 On a base of board-formed glazed concrete, also used for the loggias and balconies, these materials dialogue harmoniously. 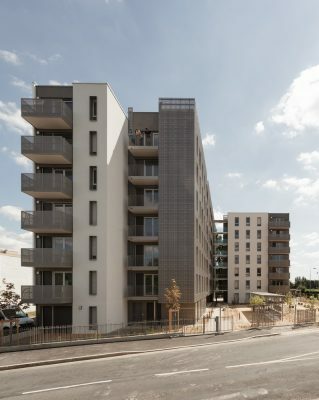 A light-coloured coating is used on the external insulation on the north side of the building, the gables, and the east facade of the second building. 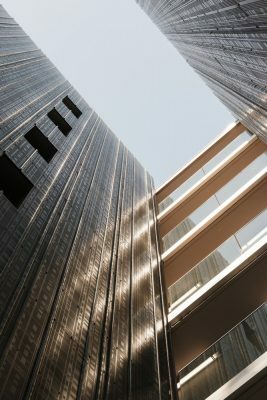 Elsewhere, a metal skin that is pleated, perforated, and ribbed with a vertical pattern forms a darker bodywork which changes colour with the light, creating reflections and transparencies. 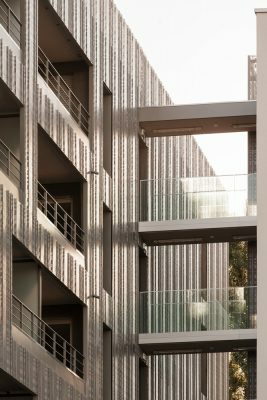 The perforated metal balcony balustrades echo this material used in a different way with the same aim of preserving the translucency. 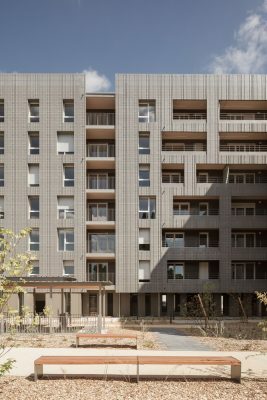 To the north, the building plays with the patterns and thickness of shadows. 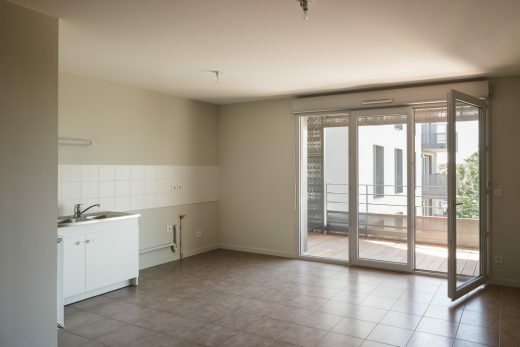 On the north facade, the windows of the bedrooms, kitchens and bathrooms create a pattern and shadows. 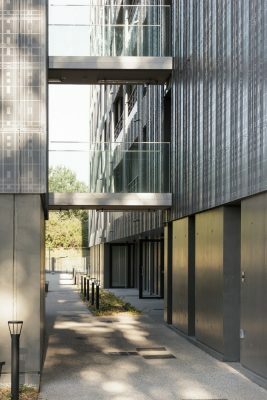 The aluminium frames overhang to different extents from this deliberately smooth facade, creating clear but variable shadows. The architects also chose to group the frames vertically on three to five levels, forming large gaps to create even more movement. 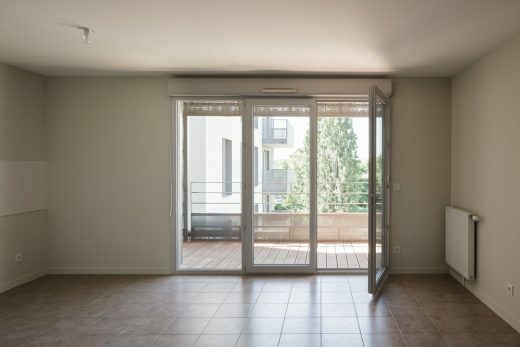 These variations around the windows contribute to the concept of a facade alternating full and empty spaces, very distinct from the facade with its metal skin. The garden is located to the south of the plot. 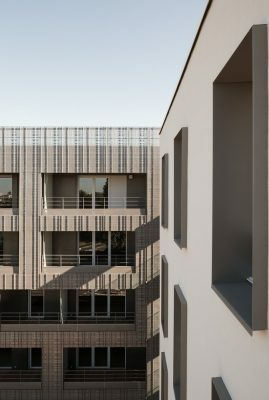 Like a projection on the ground or the extension of the buildings, the garden is composed of planted strips running parallel to the apartments. These strips stretch from east to west. They are planted with a range of plant varieties or filled with stabilised sand. The outdoor cycle sheds fit into this pattern. This garden, open onto the town, provides a variety of spaces and atmospheres, areas to rest, to walk or to play. The strips extend to the administrative limit of the plot without emphasising the curve. The planted strips are separated from the road with wooden fencing and the mineral elements with a metal fence. 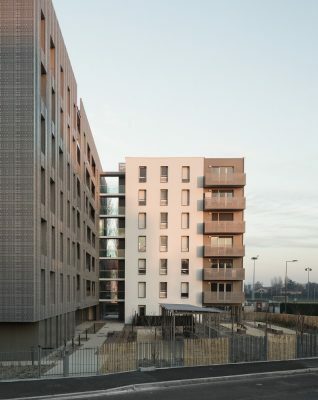 It is commonly said that social housing projects, although present considerable constraints and difficulties, are a forum for experimentation and are often at the forefront from an environmental, social, and of course an architectural perspective. Cap Canal is by no means an exception to this rule. 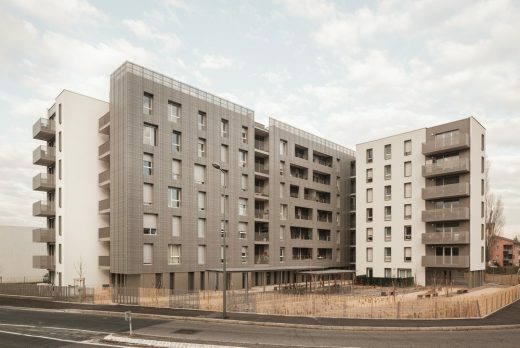 Firstly, in terms of the social mix, as it combines an affordable housing programme with 19 homes sold to Rhône Saône Habitat, and 37 social housing units for rent, managed by Est Métropole Habitat. 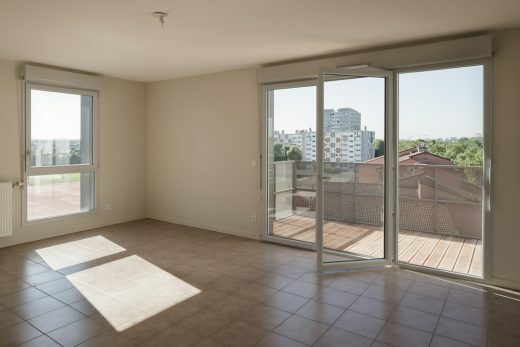 All the apartments provide a high-quality environment to maximise the comfort of residents: large balconies, dual aspect, apartments which are not overlooked, large bay windows letting in plenty of natural light. 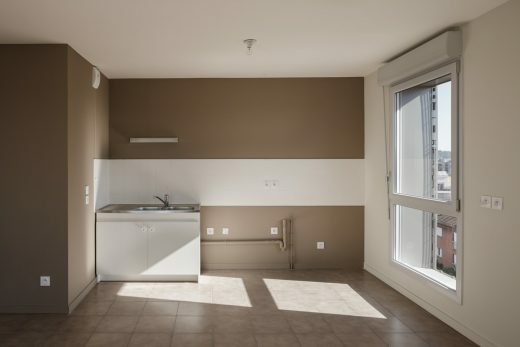 The colours used for the facade were adjusted in conjunction with the Villeurbanne city council colourist, as well as those used in the communal areas of the building and the interiors of the rented apartments (EMH) where a pallet of three colours was chosen for the bedroom, bathroom and kitchen/living room. 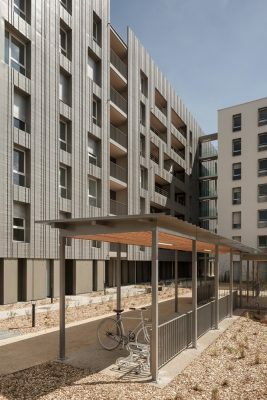 From an environmental perspective, the project meets the objectives of the 2012 thermal regulations and the Grand Lyon guidelines. A number of measures have been used including optimal compactness, external insulation, a wood pellet boiler and a clean worksite charter.